I'm looking for funders to help our junior rugby team! With the need for kits & equipment for our young boys & girls, we live in a deprived area and the need for active sports in our area is increasing! Carmarthenshire is one of the top areas with a high percent of childhood obesity and something needs to be done! With more funding it allows us to buy the equipment needed to help children get ACTIVE! 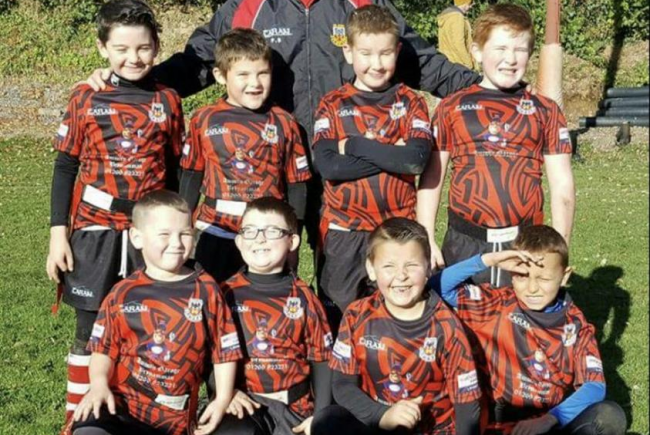 By supplying children with the correct attire (shorts, togs, socks, jerseys) they are able to take part in the sport and look like all the other children, we do not charge children a fee to be join our club everything is free but there is a big issue as a lot of parents in the area simply can not afford to buy the kits needed. To erect new flood lights on our pitch so that in the winter months our children can still play sports. We are an area that need to get healthy and active, with funding I believe we can make a massive difference to the children & parents in the area. Childhood obesity is on the rise and I want to help change this!! I want children to enjoy sport! I want them to all feel confident to take part, this will help in later life with self esteem and motivation to lead a healthy active life. Mother of two beautiful boys, my eldest loves rugby & my baby loves..... FOOD!! I'm a family support play worker for a family centre in our local area, I Love helping others and love fundraising for different organisations and charities. Project Delivery Manager: Maria D'angelo The Project Delivery Manager takes legal responsibility for receiving and spending the funds raised and ensuring the project is delivered.